Twitter has designed its own set of characters for web tweets, allowing a much improved experience across platforms. 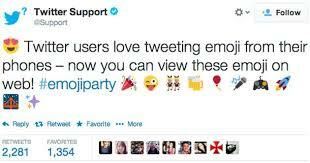 Earlier emoji characters were supported on Android and iOS devices only. Although, tweets that are embedded on websites do not support emoji’s and each character appears as a blank square on windows unless you click through to the tweet, and other platforms display their regular set. Still, addition of emoji’ will ensure that the tweets don’t appear emotionless for those who use twitter on web very frequently. Recently, , Twitter has also added the new search with Date Range feature in its advanced search in order to make it even more user-friendly. The new feature lets you search for a specific tweet within a time frame with ease.